Yes, I know it is 2014, but I am trying to work through my backlog of marathon reviews to give you as much information as possible about upcoming races. The Fargo Marathon is one of the larger Saturday marathons in the US. There has always been a lot of hype about this race and interest to match. The good reports of the marathon drew me to it and I was finally able to get there in 2010 to run it. Did it live up to the hype and good reports? Fargo is a great town that really thrives on the marathon weekend. You will see many signs on businesses welcoming the marathoners. The expo is fantastic (as non-major marathon expos go), the people are very nice, and crowd support throughout the marathon is great. When I ran it, it rained for the first part of the race and there were still a lot of people that came out in the rain to cheer us on! If you are trying to run a marathon in each of the 50 states, then Fargo has to be your marathon of choice for North Dakota. That is not just because there are not a lot of marathons to choose from in North Dakota, but it is because it will definitely be one of the most convenient, friendly, flat marathons that you will have the opportunity to run. Fargo itself is not a large city – population is just a little over 100,000. It is a large college town (with several colleges, but North Dakota State University is the largest) and is spread out enough that the city does not feel crowded in the least. The city is just a mile from the Minnesota border and the city of Moorhead. Between the two cities, you should be able to find anything you need. One of the attractions in this part of the country for many people would Mt. Rushmore. Just know that you will still be looking at an 8 hour trip to see this landmark. But, if this is the only time that you make it to this part of the country, it may be worth it to check it out. One good option would be to fly into Rapid City, SD, visit Mt. Rushmore, and then make the drive to Fargo before flying out of Fargo. It would cost about $70 a day for that one-way, but it would be the cheaper option to driving to Mt. Rushmore round-trip. Fargo is easily the most accessible marathon city I have ever been to – once you get there! You will be able to see the Fargo Dome (where all expo and race activities take place) from the air upon landing. That is not too surprising of itself considering how flat the terrain is, but you will still be able to see it from the ground. 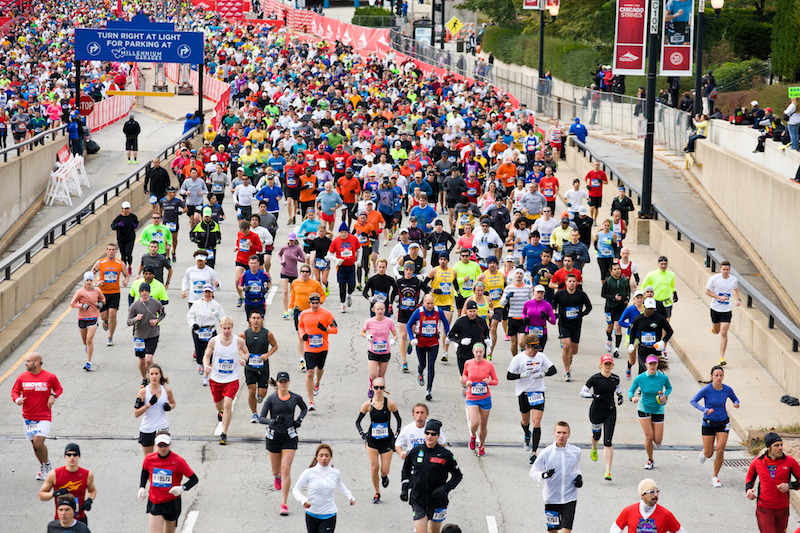 In fact, if you would rather not rent a car, you could either walk or take the hotel shuttle to one of the nearby hotels and you would be able to just walk to all race events! No car needed! I love marathons that have everything in a central location. It just makes the whole process a lot easier and eliminates the need for walking a lot just before running a marathon. Unfortunately, because it was a somewhat last minute decision for me to run the Fargo Marathon, I had to get a hotel a few miles away. That meant I did rent a car (though it was only like $10 for the 24 hours). If you have to go the same route, know that the roads have great access and there seemed to be plenty of parking all around the Fargodome (very important to have!). Note: all 2014 marathon events now take place at the Fargo Civic Center. Expos at non-major marathons can be pretty hit-and-miss as far as the quality of vendors and products. I understand and appreciate the local community supporting the race by hosting booths at the expo, but it is really annoying when all that is at a marathon expo are a few booths from Avon, a real-estate agency, and a daycare (true story)! I like to see some running brands and stores present, as well as running-related vendors. Fargo did NOT disappoint! It was indeed a full-featured, packed expo. At the expo was Dean Karnazes (he had run the Fargo marathon course during his 50 marathons/50 states endeavor and had come back as the keynote speaker). I was able to talk to him for a little while about his thoughts on some different things and really enjoyed the time (surprisingly, there was no one waiting to talk to him so that is why I got to spend some time there). There were plenty of running deals available at the expo – another big like in my preferences! I could not believe the amount of running-related vendors all over the very spacious Fargodome (again, all 2014 events now take place at the Fargo Civic Center). I was able to pick up a couple of things that very at great discounts, so count me even happier! As for packet pick-up, it was every bit as organized as I would have expected from the stories I had heard. It had clearly defined lines for the various events that would take place that night and the next day. Volunteers were extremely friendly and helpful! The pasta dinner was excellent. They had different “feedings” throughout the keynote sessions. I took my meal during Dean Karnazes talk. Always great to hear of someone’s great running experiences – it was made even better by the great food. The lines all moved fast and smoothly and the pasta was, well, it was good pasta! It is hard to really go into very descriptive detail on your typical mass-produced marathon meal! 🙂 Note: for 2014, they are putting together a list of about 20 different restaurants within a few minutes walk from the Civic Center so you can get a “Taste of Downtown”. These restaurants will offer special race deals for their food. I actually had competed in the Fargo Challenge which was to run the 5K on Friday night and the marathon the following morning. The weather for the 5K was slightly on the humid side, which translated to a very rainy marathon morning. I was able to find a place to park right across the street from the Fargodome, so I sat in my car for a while to warm-up before heading out into the rain. Because of the rain, I thought that I would not be able to enjoy the friendly crowds and entertainment that this race is known for. I totally underestimated the spirit of the city’s residents! The roads were still lined with crowds of people as they braved the rain to cheer us on. I was very impressed by it and thankful! It definitely made a difference to get such support along the way. After the half-way point, the rain stopped and sun came out. More people came out on the course and there were several school bands along the remaining portion of the course. Nothing like a good marching band to pick your pace up! The course runs through many scenic neighborhoods as well as major portions of the downtown Fargo area. It is really a boost to see the various signs on businesses wishing the runners good luck, welcoming them to Fargo, etc. It is a blast to see how involved the community becomes with the marathon and certainly a high point for the city of Fargo. There was a lot more to the course, but my memory fades on the details of the course. To catch a glimpse of the course as it is today, watch this video put together by the race committee. Here is the current marathon course map. The finish area is different now than it was when I ran it, but I am sure it has the same awesome feel. I loved that the course ended in the Fargodome. It felt like you were in the Olympics as you would circle the outside of the stadium before entering via a ramp to see thousands of spectators inside cheering all the runners on. It is an incredible boost to see and hear that – I just wish I could have had it a couple of miles earlier as well! One of the cooler things to have happen at a race happened the year I ran this one. The race director, Mark Knutson (who is awesome, by the way), put a medal on the neck of his girlfriend as she finished the half marathon. The cool part was that it had an engagement ring attached as well and he proposed to her right at the finish line! You can read about it here. For recovery, it was excellent. They had a lot of food, fluids, medical staff, and places to sit. It is always a nice thing to have access to someplace to sit at the end of a marathon! Sitting on the ground always works, but getting up can be a bit of a chore. Having seats all over the stadium was a relief. Unfortunately, I do not have my medals (yes, medals – more on that in a minute) with me to take a photo of, but the medals were definitely well designed and forged. The gear bag was one of my all-time favorites – an Adidas drawbag (high quality) with the Fargo race name and logo on it. I literally use this bag all of the time. It has held together remarkably well after the last 4 years. The shirt was not one of my favorites. It had a zipper on the front (it was a 1/4 zipper, long-sleeved, tech shirt) that was pretty flimsy and would always stick me when wearing it. Also, the material was not that high-quality. I do not mind too much because I already have a ton of race shirts and the medals and bags were nice enough already. I just wish they would use a shirt that was from a better manufacturer (maybe they do now, I don’t know). Edit to add: This year, the bag is by Under Armour (another plus!) and the shirts are now short-sleeve, but no mention of the manufacturer. This is definitely a race that people should make a point of running. The crowd support is great, the town really gets behind it, and you are running on a very flat course through some beautiful areas. Plus, its North Dakota – how many of your friends have ever run a race in North Dakota? 🙂 I actually had registered to go back the following year, but my grandmother died the day before I had to leave so I had to skip the race. I am seriously hoping my calendar/schedule allows me to run it again sometime soon. It was a fantastic race and one I thoroughly enjoyed.